The name’s Bond. Jane Bond. This mission saw me crossing an international border, braving rough seas to reach a remote volcanic island then jumping overboard to share the water with great white sharks. However, Jaws isn’t a villain on this particular assignment. The sharks were my accomplices in an international operation to prove that they aren’t the man-eating, merciless killers that they have the reputation as. Streamlined like an Aston Martin, with a design that’s been perfected since the Miocene, even Q could learn a thing or two from these animals. Spending a week face-to-face with a super-predator isn’t the cheapest of ecoadventure, but, I believe it’s worth every Moneypenny. Guadalupe Island lies 241km from the west coast of Mexico’s Baja California Peninsula. Its volcanic origins and distance from the mainland give it a unique biodiversity and, in 2005, it was declared a Biosphere Reserve. Tourists aren’t allowed on the island, so, a visit to Guadalupe means spending your trip on a liveaboard boat. 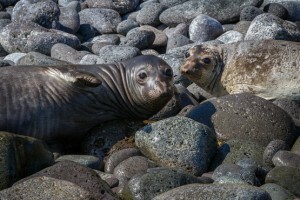 Although previously nearly hunted to extinction, the island is now home to a healthy population of northern elephant seals, Guadalupe fur seals and California sea lions. 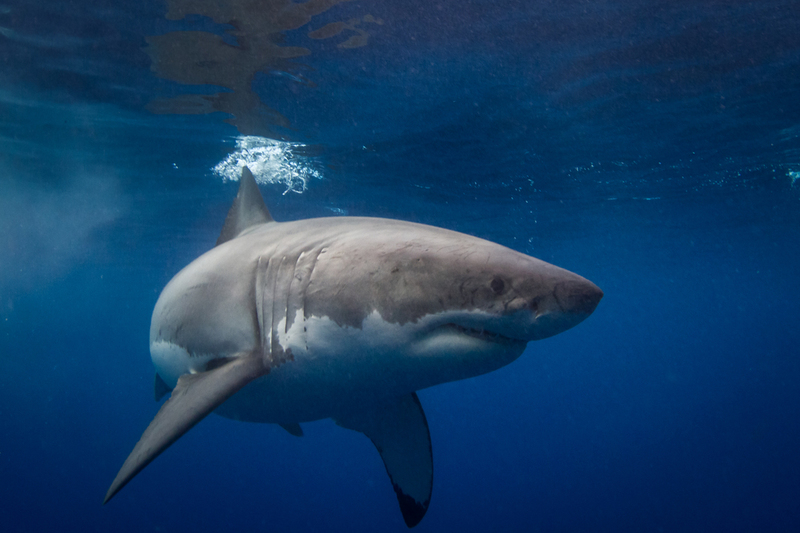 This food source is the reason that the island can be surrounded by as many as 100 great white sharks at the right time of year. It’s not only the number of sharks that makes Guadalupe the best place on the planet to see them underwater, it’s the visibility too. The dive sites often have 30m of visibility which is excellent for viewing, underwater photography and underwater filming. My liveaboard had two cages at the back of the boat. One cage stayed on the surface and you could spend all day in there watching the great white sharks when they come to investigate the tuna and chum that the crew uses to attract them to the boat. You don’t need any diving qualifications to be in this surface cage. The other cage is a submersible one. When weather conditions are good, this is lowered to about 10m (you need to be Open Water Diver certified for this experience). You don’t wear SCUBA tanks in either cage as you’re connected to air cylinders on the boat by a ‘hookah line’. The water here is cold so you’ll need at least a 7mm wetsuit with hood, gloves and booties (these can be rented from your operator with prior warning). 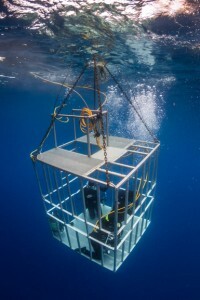 The crew will also put a heavy weight harness on you so that you can stand at the bottom of the cage rather than being flung around by the current. With all this kit, it’s very funny to watch your fellow divers waddling around the dive deck ready to hop in. Catching sight of your first great white shark is a very surreal experience. Out of the blue, you’ll see a 4m long torpedo shaped predator with a sinister looking grin, large dagger like teeth and cold black eyes. It’s only natural that your adrenaline will start pumping, as for years, you’d have been taught to fear these magnificent creatures. However, the longer you spend in the water with them, the more you’ll be able to read their behaviour and see that they aren’t after human blood (we aren’t a natural prey source for them). In fact, these sharks are a vulnerable species which need our protection. 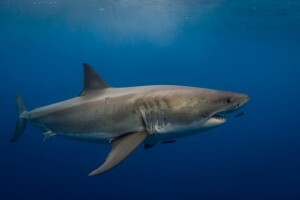 Indiscriminate fishing internationally has caused the population of great white sharks to diminish. As they have a low reproductive potential, late sexual maturity, slow growth rates and high longevity their populations take a long time to recover. Personally, I’d love to see many more of the world’s largest predatory fish in our oceans. They’ve been gliding through them since before the dinosaurs walked on this planet and fishing or culling them to extinction would be a tragedy of epic proportions. Help conserve great white sharks by donating via the button below. 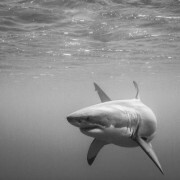 I visited Guadalupe in October when the larger females are present. I booked my 5 day ecoadventure through Club Cantamar and was picked up in San Diego, California .